I have blogged once or twice about the possibilities and realities of casinos, particularly certain key casino employees like dealers and floor personnel, cheating players or their own casinos by manipulating the Shuffle Master automatic shuffle machines on casino blackjack and baccarat tables. It has actually happened a handful of times around the world, mostly by dealers, sometimes in cahoots with supervisors, temporarily disabling the machine to protect their own false shuffles. Recently I received the following email from a very knowledgeable person presenting an intersting Shuffle Master casino cheating scenario. Below his email query is my response. I read the article on your site about the potential for casinos or their employees to cheat with gaffed Shuffle Master automatic shuffle machines (ASM's). After a brief discussion, you concluded that there is no real risk to players of being cheated with gaffed Shuffle Master machines. You basically concluded that although such cheating is possible the risk for casinos or their employees is too high because too many people would have to be in on the scam. I question your conclusion that the risk of such cheating is very low. For instance, there is one likely scenario that you did not consider that I would like your opinion on: Shuffle Master does not insist that casinos using their automatic shuffle machines have only Shuffle Master employees service the machines. 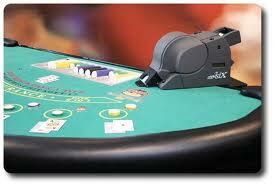 Shuffle Master is perfectly willing to train casino personnel to service the machines, themselves. So, suppose a senior manager at, say, a California Indian casino where State and federal oversight is weak) decides to cheat players at, say, double-deck blackjack shuffled with Shuffle Master's MD3 automatic shuffle machines. It would seem to me that all that would be necessary would be for the manager to obtain replacement computer chips with a gaffed shuffle routine, and during "routine" service on the MD3 machines have a trained casino technician (also in on the scheme) modify the MD3 motherboards with the new chips containing the gaffed shuffle routine. This would mean that only two people would have to be in on the scheme (plus the supplier of the gaffed chips who would probably not know where the chips were going). With so few people aware of the scheme, and with weak State and fed oversight, it seems to me that such a scheme would be relatively easy to pull off. Now, why would a a senior manager of an Indian casino do this? Because (with weak State an fed oversight) the risk of getting caught is very low, and such cheating would provide impressive performance numbers that would increase his performance bonuses and juice his career. Also, at those Indian casinos, such as Thunder Valley in Lincoln, CA, that manage their own casinos, senior casino management often consists of tribal members who benefit directly from increased earnings. So, what is your opinion of the above scenario, Richard? Do you think it's plausible, or do you still think that even in Indian casinos with weak State and fed oversight the risk of being cheated with gaffed automatic shuffle machines is nominal? My Response: Although your cheat scenario is very well thought out and plausible, it is still very unlikely. Don't forget, the person you need most in your scenario is the dealer, so now your talking about two inside employees plus someone to supply the gaffed chips. Let's even say that this exact scenario happens ten times a year across the world. That still makes the odds of any player being cheated this way negligible. A better scenario for Shuffle Master cheating is simply having one employee or two disabling the machine for a short period of time. This form of cheating via Shuffle Master automatic shuffling machines has indeed happened, although not very often when you consider the number of blackjack, poker and baccarat tables across the world using them.